The VIGO Callaway Shower Massage Panel creates an unforgettable showering experience thanks to three centrally located adjustable body spray massage jets and a rain showerhead. Add to that a 4-way multi-function hand shower with a 60 inches chrome plated hose and you can be sure this shower panel will please even the most distinguished of guests. Panel is pre-plumbed for easy installation. Dimensions 1.0 In. X 5.5 In. X 51.38 In. Great shower panel! Treat yourself! I purchased this to include in a master bathroom remodel. It is amazing. It is not as sleek as some of the other models available, but for the price, this is great looking. I purchased the option with the satin finish on the box/panel part and a chrome finish on the knobs, shower head and hand shower. This worked great because we were able to go with a cheaper chrome finish on a similarly styled shower head on the opposite wall of the shower. The Rain shower head is wonderful and works great but is not multi-functional. 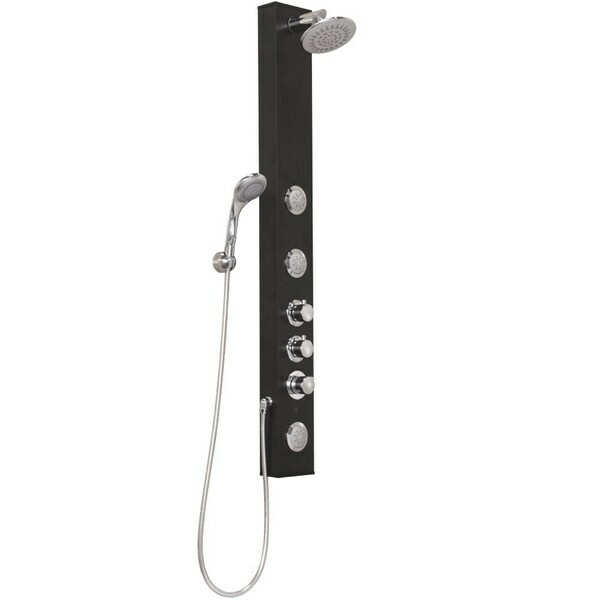 The hand shower has multiple functions and can be installed at a convenient height. The body sprays are powerful but not adjustable. The panel also has options for water temperature and strength which are really helpful options. Do be prepared that only one function is available at a time. The body sprays are not operable at the same time as the either of the showers. Good to note, the panel doesn't seem to spot with hard water stains. I've been using it for three months now and it dries nice and cleanly each time. This is one of my favorite things about my entire bathroom remodel. You get luxury with a nice price. Treat yourself! The unit arrived from Overstock within 2 business days and was well packaged. The black matte color strikes a nice contrast against the carrera natural stone. We have a couple of massage panels by Dreamline which were significantly heavier than the Vigo shower massage panel, but this Vigo appears more attractive. The design of the showerhead location is excellent for bathrooms with low ceilings, such as basement showers, since it does not extend higher than the top of the panel. I've had this for a couple months now and this shower panel has provided the experience I was looking for. A nice relaxing shower and a perfect compliment to my completely remodeled bathroom. The shower head provides a nice full stream, the jets are powerful enough to provide a massage like effect and the direction can be adjusted as needed. The detachable shower head does feel a bit light, but considering price, I cannot and will not complain. Overall this is a solid purchase. I'm really enjoying it. This shower panel looks great, is functional and really adds to the look of my 3x5 shower! I put this shower into my new bathroom and am I ever so glad that I did. Every function, the rain shower, the massage showers (that hit just the right tired spots), and the hand held adjustable head---all together give you the luxury that all of us crave after a long day or a sluggish morning. Money well spent. I love this panel. My plumber liked that the body jets and install went easy during our bathroom remodel. One thing that we had to adjust was the recommended height of installation. We raised the installation height so that the bottom of the shower head cleared our door. From day one we enjoy our bath experience. This item came wrapped and packed securely. The assembly was easy although the instructions were pretty close to worthless. I have purchased similar shower panels from overstock in the past and was happy to see that the body on this one was fully aluminum. The matte black finish looks amazing. The only gripe I have are the cheap come plated plastic piece used for the shower head and hand held body spray. Otherwise we'll worth it. i think it was our plumber's first time installing a shower panel. He seemed to be unsure at first but I don't think he had a hard time with the installation. It's a lot bigger than I imagined. Looks very sturdy and good quality. Looks a lot more expensive. Good water pressure. Looks good in our bathroom. The only reason why I did not give it 5 stars is because there's no way to increase volume on body jets. There appears to be many holes on the jets where no water comes out. Reasonably priced and stylish looks. Easy to install and keep clean. So I have purchased a second one for the guest bath. Wonderful jet sprays for back massages. We bought it in Jan, and so far no problems. Great price for what you are getting. We all love the versatility of the shower/jets combo, although cannot be used all at once. We are amazed with the force of the shower output. Definitely will consider it for another bathroom reno. This product is great. Combination water flows are: Big round head solo, small head solo, Big head & small head combo, Big head and back jets, & just back jets. This is great for a small shower with multiple occupants! The temperature control is very spot on and consistent and the there is no lacking in water pressure because it all comes from one main water source. The back doesn't leave water spots as bad as I thought it would either. Plumber said it would cost a lot to install. Would have had to take a lot of tiles out . The panel was too narrow. I chose the satin panel but alas I did not measure right or something. It was a good deal. Had to send it back. Plumber thought this was an interesting shower panel and had never installed one before. He said the install was easy. Jets are great and the handheld is great. Symbols on the handles would be helpful when turning on, but I'll get used to what they are. Excellent would buy again every family member loves it it really works great and we fight over shower time. Really gave a hotel look to our bathroom. This was easy for my contractor to install and looks very good! My family loves the jets and the pressure is perfect. It was also cheaper than at the large retailers. Love this shower tower! Looks very sleek and modern in my new shower. Works absolutely wonderful. The jets are perfect. My husband was skeptical at first but really loves it now. Get so many compliments from guests. Definitely recommend. This work excellent in our tiled shower. We put it in the corner and its nice to have different features and the wand is great for when I need to clean. A stylish way to give a bath a spa like look and utility without thousands in various plumbing hardware. Quality is good for price. I would have preferred more metal and less plastic. Will see how hold up over time. Easy to install and hook up. Nice. The shower pressure on this shower is great. The only problem we are having is that the massage jets are too high. We would need them to be much lower. Needs professional installation. Difficult to have repaired. "what's the maximum gpm (gallon per minute)?" "Can the overhead be ran at the same time as the panel portion?" "Would you recommend this for an outdoor shower?" Absolutely I would recommend for outside shower! I love it ! Yes! I purchased this unit for an outdoor shower. It works great and it has "held up" very well to use and the elements. "What is the minimum and highest psi for this unit?" I have two of them but they are indoors. I can't see why you couldn't use them outdoors with just the usual maintenance of wiping it off after use and doing reasonable care to prevent it being over exposed to heat and cold. I live in Arizona an would be comfortable having it outside provided we protect it from the sun. "Can this unit be installed in a tub/ shower combo?" This item could be installed in a tub/shower combo as well. If your shower has the room to fit this unit you can use it just about anywhere. "can this be installed on a fiberglass one piece shower enclosure?" Hello jakesr, the shower massage panel can be installed on a fiberglass enclosure. I hope this info helps. Thanks for shopping with us! "can the shower head and handheld shower be used at the same time?" Hello mycodie, unfortunately, the shower head and handheld shower cannot be used at the same time. Sorry for the inconvenience. Thank you for shopping with us! Yes, I do that all the time. The jets also work the same time as the shower head if that's what you want.